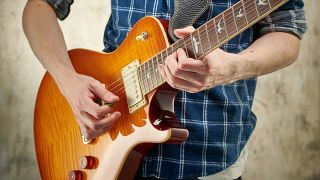 30-day guitar challenge: Do your improvised solos feel like you're just rehashing the same old licks? We hear you! Improving your improv skills can be a long haul and we could fill the whole site several times over on the subject. You can still find some easy ways to get started though, and our advice is to apply some limitations to your playing when you improvise. For example, limit yourself to just one scale, or jam over one simple chord vamp. Perhaps limit your jam sessions to one or two favourite tracks so you can get used to their structure. The idea is to focus on a few songs, scales and techniques so that you don’t become overawed by the seemingly limitless other ways that you could be improvising. Which notes should you use? There are literally hundreds of scales you could use, but we recommend working with the major and minor pentatonic scales (shown in E here) when you’re improvising. These easy to remember shapes are a solid framework to start from. Just use the major pentatonic for major keys and the minor pentatonic for minor keys and experiment with non-pentatonic notes with a more random approach. Okay, sticking to one note might not sound like a recipe for a world class ad lib, but, as a way to practise, it’s brilliant. By ditching all the other notes, you can focus on rhythm and dynamics (how loud or soft you play). As your ideas take shape try the exercise with two notes. Try out your own ideas - our tab is just one possibility. The idea here is to confine your improv to one string. Choose an open string that matches the key of your jam session, eg, use the E string over an bassline in E. Use all of the notes on the string and try to make a feature of notes that clash (and some notes will definitely clash!) by returning to them confidently. This is a big part of improvisation: just play a simple lick or phrase, play it again and then change it bit by bit on each repeat. It’ll make your solos unfold gradually, with a more organic vibe than a series of disconnected licks. We’ve taken a short line, changed the last note and then altered the melody. The possibilities are endless. We’ve provided a short backing track for you to play over. It’s a simple groove in E, so you don’t need a chord chart - just get jamming.